Having moved to northern Illinois in 2016, John and Allison were looking for a great, local place to take their daughter for a tasty donut on Saturday mornings. As longtime foodies with career backgrounds in the corporate quick-serve industry, it quickly became apparent to them that something was missing in the nearby options. They thought, wouldn't it be great to have a neighborhood café that featured yummy treats in a comfortable environment, with high-quality coffee, too? Unable to find the perfect match around their home, the couple set out to start their own concept. 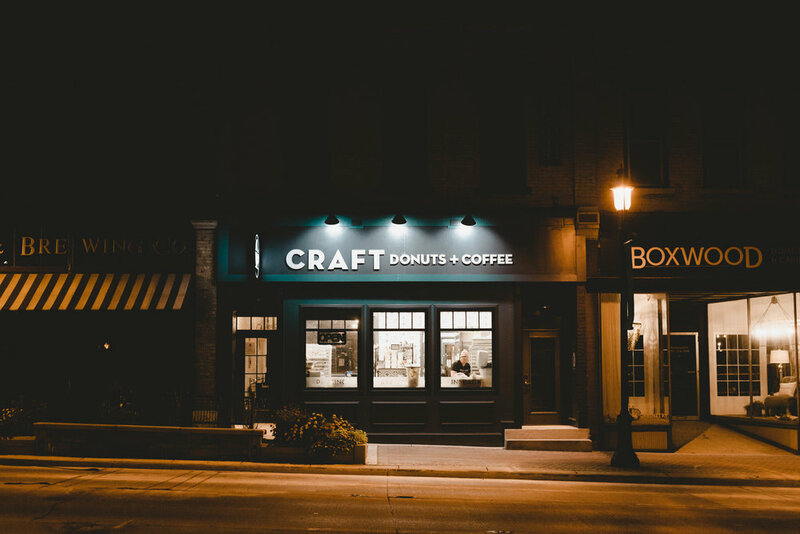 Determined to combine a unique, inviting environment, scratch-made quality products, fresh coffee, and prompt, friendly service - the idea of CRAFT Donuts + Coffee was born. As small business owners, John and Allison have heightened focus on assuring guest satisfaction with every aspect of the experience, and strive to view every decision made through the eyes of their guests. From their years of being on both sides of the restaurant equation (employee and guest), they have high expectations for both quality and service, and are willing to put in the time and effort needed to execute on those expectations themselves. They have a commitment to their team members, as well - to aiding their future development by providing great leadership, a hands-on training experience, and a fun, safe, energizing, professional environment to work in each day. The duo hope that the knowledge and skills their team learns while working at CRAFT will someday allow them to pursue their own entrepreneurial spirit. John and Allison are thrilled to be launching their concept in historic downtown West Dundee. The heritage and character found in the old buildings there is really something special. Their mindful approach to choosing the location and restaurant design has created a unique, welcoming space perfect for a quick breakfast with family or friends, a mid-day meeting over coffee, or an afternoon study group needing a place to gather. Guests may watch through the kitchen windows as the CRAFT team creates fresh donuts by hand in small batches, using real ingredients (instead of the pre-packaged mixes, or even pre-made donuts found at some other places.) Partnering with a local roaster in Chicago, coffee drinks are brewed only days after the raw beans have been roasted, for peak flavor and freshness. Building on their backgrounds in the corporate restaurant industry, and appealing to their inherent love of delicious food, John and Allison strive to create an exceptional experience for their local community. By offering a handcrafted product in a truly unique environment, they are well on their way. Come visit John, Allison and the team at CRAFT Donuts + Coffee soon!